347 Paisley Road West, Glasgow. G51 1LU.Tel: 01414272784. The Clachan dates back to the end of the Second World War, part of the premises was formerly a hatter & hosier shop owned by Thomas Kay the other part of the premises was owned by the Kinning Park CO-OP Society. When the war ended William Morrison a well known Gorbals publican took over the old hat shop. Mr Morrison formerly owned the Clachan Bar at the corner of Lawmoor Street and Ballater Street, Gorbals. The premises gradually enlarged over the years taking in the CO-OP building. When William Morrison retired his son Watson took over the running of the business. In 1959 Mr & Mrs Morrison celebrated their golden wedding at the Grand Hotel he also celebrated the fact that he had been a publican in the city for over 40 years. Mr & Mrs Morrison celebrating their Golden Wedding at the Grand Hotel 1959.
left to right Mr & Mrs MacKenzie (son in-law and daughter) Mr & Mrs W A Morrison, Mr & Mrs Wilson (son in-law and daughter) Mr & Mrs Morrison cutting the cake and Rev. W. F. Wills and their many grandchildren. 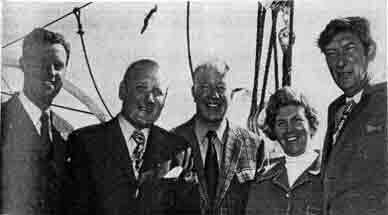 Mr. Eric Ewart (Johnnie Walker); Mr. J. Watson (Schweppes); Mr. Watson Morrison (The Clachan); Mrs. and Mr. Hugh Nicol (Royal Oak, Barrhead.) 1972. Regulars at "The Clachan" in Paisley Road West have been watching with interest the work being carried on next door to their favourite howff for the past six months. Well now all can be revealed. Just opened yesterday was the Bothy Restaurant, an extension to the existing premises at the Clachan. Mr. Watson Morrison, the man behind the popular Clachan, has been keen to extend his premises for some time now and he took over two empty shops next door six months ago. The Bothy gives you the feeling of stepping back several hundred years in Scottish history. Heavy beams 21in x 12in, and loft windows help the old Scottish bothy influence. The walls are done in a rough plaster and the seating and carpeting in rustic browns and custard colours. There are several old fantastic bar mirrors on the walls, and more unusually, stuffed animals in cages. And usually there will be a log fire in the lounge. In the bar area there is a natural stone floor. In the dining-room itself, at the far end of the Bothy, there is seating for more than 30 people. The Bothy's speciality will be grills with starters like prawn cocktail, or soup. There will also be a "Chef's Special." The main entrance to the Bothy is from Paisley Road West, but there is also an entrance to the dining-room from the Clachan Lounge. Watson Morrison has been in the licensed Trade in Paisley Road West since 1943 and over the years The Clachan has become famous. As one of the waitresses at The Clachan said, "It's just like a club. People will come in here and talk to their friends or they'll maybe just sit in a corner with a newspaper. It's really just like their home." Although the Clachan does bar snack's the addition of the Bothy will undoubtedly mean a better service for regular customers and will also encourage others to leave the attractions of the city centre for Paisley Road West. 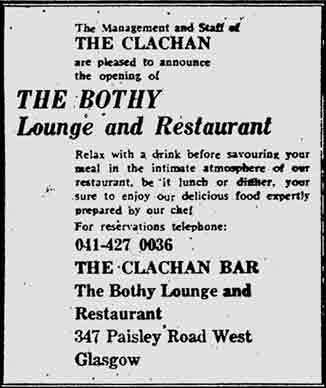 The Clachan, the Bothy Restaurant, advert 1974. Rangers Manager Jock Wallace had a "smashing" time at Watson Morrison's Clachan Bar in Paisley Road West, Glasgow, when he opened a gallon bottle in which more than £81 had been collected from customers by head barman Charlie Ruxton and barmaid Greta Palfrey. This marked the latest fund-raising venture by the Scottish Taverners, a group of 40 hoteliers, restaurateurs and publicans who got together two years ago to support Scottish charities. Since then they have raised more than £20,000 mainly from sponsored golf outings and generous donations. Of that amount, £12,500 has gone to many charities, helped to purchase two Variety Club Sunshine Coaches and paid for the installation of a kidney machine in Glasgow's Stobhill Hospital. 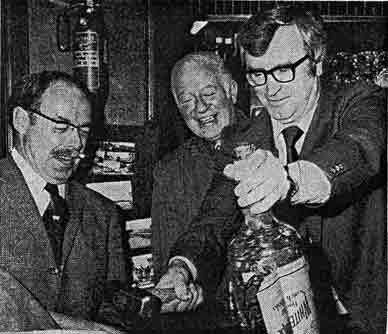 After Jock Wallace had smashed the bottle, Watson Morrison (pictured with White Horse representative Douglas Wood) announced that a raffle among customers to guess the amount of cash inside had raised another £85. Interior view of the new lounge bar 1963.